My Last post as September's Guest Designer at Paper Smooches. I am so thankful to Kim for this opportunity, and hope I have shown off her wonderful stamps and dies to their advantage. I used the die set Super Star Dies, and sentiments from My Guy. I thought this would be the most challenging for me...but once I thought about it, it came fairly easily. I love that that big star can be cut with or without the face. There are a bunch of star dies on this one. 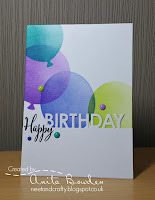 Thanks so much for stopping by, and check out the other cards for this new release at the Paper Smooches Blog. Have you ever been excited about a stamp purchase...waited for it to be delivered, gotten it your excited hands, and then been disappointed in your creations? That happened recently for me with a Mum's stamp. The stamp and image are fabulous, but I was so not pleased with my watercoloring efforts. I made a slew of cards with several color combinations. I don't know why. So I decided to sell the stamp set knowing I would rarely use it. It sold in the blink of an eye likely because it was a newer stamp. I have sold several stamps and dies over the last few years, my storage space is limited so if something comes in something must go out. I would sometimes have a bit of remorse having sold the item, but I solved that issue by stamping off or die cutting a dozen of whatever I sell. That seems to keep me quite satisfied and no more remorse. So the point of the long story...here is a card made with the mum stamp. I am not mentioning manufacturing names, because the stamp is beautiful...its me. I had trouble showing it to its potential. I love the stamps from this particular manufacturer. I do like the stamp simply embossed in copper on black cardstock with a CTMH rose gold foil strip and some coppery sequins from Pretty Pink Posh. I also embossed a few more in white, and I am going to try the watercoloring again probably with zigs this time. So what do you do with your highly anticipated purchases, that don't live up to your expectations? ETA: Thanks Betty for the note...I am entering this over at Inspired by all the Little Things. 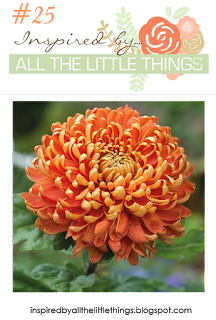 They have this beautiful chrysanthemum as inspiration. Today is my Dad's birthday. I won't see him for a couple of weeks yet, but I have sent him cards. Yes cards in the plural. One from the cats, one from hubs and I. This one is from Hubs and I. My Dad often sits in the back yard, not on the swing because of course the cats are there, but in a chair near by and the scene does sometimes look much like this. And here are the trouble makers Digger and Jack. The stamps are a little girly, so I put blue bows on then. I am sure the cats will approve. A friend of mine asked me to make a card for her to give to her daughter. I was thrilled to do so. The flowers are from Technique Tuesday, coloring was with copic markers and the sentiment came from the same stamp set. I love the woodgrain stamp from Stampin Up as a backdrop for flowers. Here is my card for Casology's challenge FRAME this week. The tulips are stamped in side the card, the opening has a second layer added with the Happy Birthday sentiments stamped all around it. You can see that the frame is just a touch more white than the card base. The flowers and the sentiment both are from Simon Says Stamp. 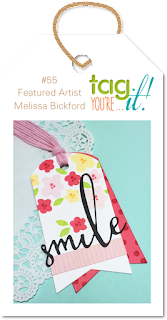 I am up again at the Paper Smooched Blog as September's Guest Designer. This week I am showcasing the Arrow Dies...they are seriously cool, the tails have separate pieces that fold up and make them 3D. I also used a sentiment from an older Paper Smooches set Sentiment Sampler. There are actually 3 different Arrows, I used only two as I wanted a masculine feel for this, the third arrow has a heart shaped tip, and I thought that might be a bit too feminine for this card. I almost put DUDE under the way to go...but I held off. I hope you have some time to stop by the Paper Smooches Blog to see more projects using the September release! Thanks for stopping by! Every summer I try to get in at least one boat ride in one of the many waterways around us here in Maryland. The Friday of Labor Day Weekend, hubs and I finally got out to take a 90 minute cruise out of Annopolis. We cruised out and under the Bay Bridge and back. It was finally a day that wasn't so sweltering and it was a perfect day on the water. I once had a bridge phobia and since living in Maryland, a state full of bridges, I have overcome that fear. I have driven over this bridge even in the dark, and have ridden across it several times. Those first few times I rode across it, my eyes were shut and hubs had to tell me when I could open my eyes. Here are some pictures its a double bridge and the directions on either side can change depending on traffic volumes. Two Ospreys make their home on one of the buoys. After our cruise, we dined at a German restaurant not too far away. It was a fun afternoon and evening. Since hubs doesn't get a lot of cards from me any more, I thought I'd send this one to his business address as a thank you for a special date. I used the SSS stamp set Sailing, and a Hero Arts set for the sentiment. Now that I have gotten a sail boat card in, I can start on those fall cards. Here is another card from the Paper Smooches September release. This card uses the Sweet Heart Frame Die, Feather Friends Stamp Set, and an older sentiment set Sentiment Sampler. I hope you'll make time to visit the Paper Smooches blog! Thanks so much for stopping by! I'm getting my mojo back and am zipping in at the last minute. The colors for Color Throwdown are fabulous! The window cut out is from MFT, Jumbo Peek a Boo Circle, the houses and stars are from Ellen Hutson Home and Hearth. For those of you who know how I fear washi...let it be known, there is a strip of washi inside this card! Today, I strolled through some challenges. The challenge from Tag You're it seemed a good jumping off point. I love flowers! Tag Shapes were cut using PTI's Tag Sale 5 from two scraps of paper, dotted and woodgrain. The sentiment is from SSS Painted Enjoy, the flowers are SSS Fresh Daisies. My coloring medium was Spectrum Noir Sparkle pens. Anita Bowden is our Muse this week, and I am getting my card in barely under the wire! Balloons are so festive and I love the translucent quality Anita has brought to her card with the overlapping balloons. Stamps are from SSS , and the Happy banner is from MFT. I have been mojo-less since I got back from Ohio, I had a few cards I made before I left that have recently been posted. I made my Paper Smooches cards for the Guest Designing gig, but other than that my creativity had flatlined. Best thing to do, is to just jump in and get warmed up! 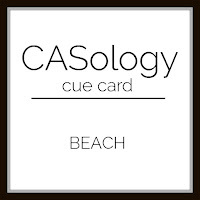 Casology's cue is Beach. One of the things I love about the beach is 1 hour watching the water is like 2 hours at a spa. I also love to pick up seashells. Those thoughts inspired this card. And I kept it simple...cause I need lots of man cards. The relax die is from SSS, and the shells come from Close to My Heart. P.S. Don't forget Wednesday is my next installment as Guest Designer for Paper Smooches. I'd love you to see what I made. Ya I am still crushing on those cute crazy dogs. This one was mailed - so no googly eyes. I recently bought colored envelopes for birthday cards. I think its just a bit more festive. I was so thrilled to have been chosen to Guest Design at Paper Smooches for the month of September. Kim generously sent along stamps, matching dies, and several stand-alone dies. I have several Paper Smooches dies, and stamps already in my stash, and it was fabulous to have these additions to play with and guest design. My posts will be going up each Wednesday in September. I sure hope you stop by each week to see what I've made. This is from Feathered Friends. There is this sweet little flower amongst all the birds. I also have the Paper Smooches mirror blocks, so I could stamp the flower tilting both ways. The sentiment is from Word Salad. Take a peek over at the Paper Smooches blog for these September released items. I resisted those crazy birds for a long time, then I broke down and bought them. Neither hubs nor my Dad like them at all...so they need to leave my stash. Taking their place...my crafty friends thought for sure would be the crazy cats...but no. They kinda freak me out a little bit--remind me of Halloween, and that is not one of my favorite holidays. I prefer cutsie Halloween over scary Halloween. However, those crazy dogs...well they are so darned cute and adorable. Those I definitely LOVE, and they had to join my stash as soon as I could grab them. Don't ya just love those googly eyes? That tongue reminded me of a heart, so this has to go to hubs. I am sure to have more dog cards coming up. Thanks for stopping by. I sent this card to Betty this month. I am on the road so the posts are short!